The Professional Regulation Commission (PRC) announced the schedule of application, deadline of filing as well as requirements for application in March 2017 Licensure Examination for Teachers (LET). The board exams for teachers will be held on Sunday, March 26, 2017 at various testing centers in Manila, Zamboanga, Bacolod, Antique, Pangasinan, Laoag and all Regional Offices nationwide. 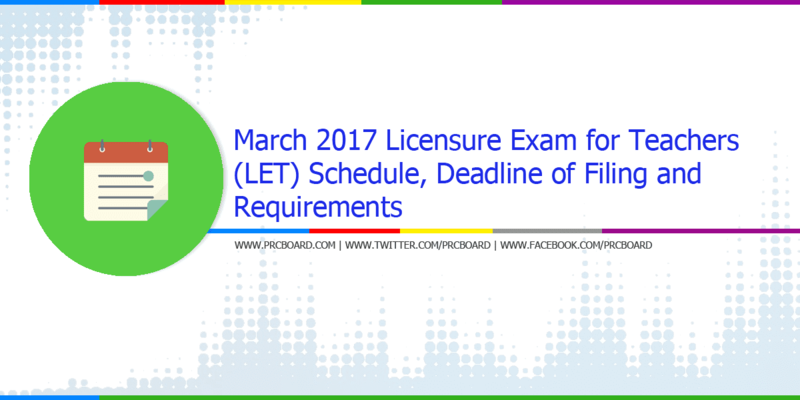 Below is the detailed schedule for March 2017 LET as per PRC Resolution number 2016-1019 series of 2016 entitled “Schedule of Licensure Examination for the Year 2017”. For PRC Tacloban Regional Office, the BLEPT Application deadline has been moved to Monday, January 23, 2017 due to cancellation of classes and work in all Government Offices in Tacloban City last Tuesday, January 17, 2017 due to extensive flooding brought about by heavy rains. All other Regional Offices and Service Centers shall follow the January 20, 2017 BLEPT deadline. Applicants can also process their applications at selected mobile locations at Robinson's Malls, SM Malls, among others. Details of which are written at below article. PRC also reminds applicants to secure all requirements and payment before proceeding to PRC centers for further processing of applications and also avoid further inconvenience. On September 2016 Licensure Exam for Teachers, 23,378 elementary teachers out of 77,466 examinees (30.18%) and 31,334 secondary teachers out of 92,754 examinees (33.78%) successfully passed. Full details of the results are written at below article. can i take my passport size photo anywhere? i am longing for the answer . thank you. you can! as long as it matches the requirements above. hanngang kailan po ang filing ng repeater, salamat. Pwede po ba magfile sa Lucena, kahit ung mga requirements ko po dati ay pinasa ko po sa PRC main office sa manila? kelan po deadline ng pagfile ng mga repeaters for march 2017 let exam? hello po i need help lng po..repeater po kc ako pwde po bng baguhin ung address ko kc d2 na po ako sa manila dw dti po kc sa province pa.
for, repeater, do we need to pay again? how about po sa application number hanggang ngayon kasi hindi ko pa alam si ratings ko dahil wala po sa NOA ko at hindi ko mn po kasi alam na kailangan pla iyon. nakalimutan q rin sulatin yun application number sa NOA q. paano ko ba makukuha iyon sa PRC? pls reply po kailangan lng. ask lang kailan po yong ung last filing ng mga first taker? totoo poh bang wala ng major sa mga secondary ? prof. ed lang daw tsaka gen, ed ? pedena po ba sa mall mag fileng let? This will be off-topic pero I need an answer po. I am a graduate of Ab-English but I decided to take 2nd course since nag offer yung isang bagong school dito sa amin ng BTTE Technical Drafting( I was a drafting student since I was in highschool) pag mag take ba ako ng LET what major po ang i-credit ng PRC? I want to teach what is my interest po which is technical drafting. hello po. ask ko lang po yung about sa repeaters requirement po na TOR with special order ano po iyon? Saan po ba pwdeng mkita Ung application number kc last let mali Ung application number ko at d ko mkita Ung rating kc not valid Ung application number? May nagsabi na hanggang JANUARY 15 lang ang filing ng repeaters? How true is that? :) thank you..
gang kelan po ba ang filing ng mga repeaters kasi sabi po ng iba 15 ehh linggo po un .. nakalagay kasi sawebsite nila 20..
kailangan po ba na latest ang cedula or pwede naman gamitin yong 2016 cedula kahit sa online app lang? thanks. How many copies of nso birth certificate and documentary stamps do I need? Kailan po ang last filing para sa repeater? hello po ask ko lang kung may slot p ng let exam ds march,2017..bale nursing graduate po ako at kumuha n ng 18 units ng education allowed na ako mag take di ba? anu mga requirements ko? ..bale nursing graduate po ako at kumuha n ng 18 units ng education allowed na ako mag take di ba? anu mga requirements ko? good day sir/madam...ask ko po about the reference number para makabayad po ako sa LET march 2017....im waiting po.this is jose adornado jr..
Repeater po ako,,nawala ung NOA ko pwd pa ko maka file? hello po , saan po dito sa bacolod ang registration? PBET passer na po ako. pero gusto ko na mag update/upgrade ng Teacher eligibility ko kaya gusto ko mag exam ng LET. The same requirements pa po ba? Please acknowledge admin. Thank you po. Pwede po ba iba yung magpasa ng requirements di po kasi ako makapunta sa prc office dahil naaksidente po ako..
Pwde pa po ba mag apply for let exam ngaun? Where is the online reviewer? Good pm.I had my last LET exam 1990's.am I qualified to take again on the next schedule?what will be the requirements? why poh hnd ko po mkta name ko s room assignment s my rosales pangasinan. of Bicol University -CBEM at Daraga Albay. Unlikely my Surname was cleared to a DELMITA that as published by your office my Surname was DELNITA could you check further my application and attachment for examination and could I preper to be there at Legazpi City Office on March 24,2017. thank you and god bless. What happens if you don't pass the exam? And is there a scheduled date for the next LET? Good eve po as a repeater no need napo ba ng processing fee 900 or meron po? Hindi po naka.indicate sa taas,verify ko lang po..salamat. mag take po kasi ako ulit,Congratulations po pala sa lahat nang nakapasa March 26,2017..inquire ko din po pala pwede napoba iverify ang ratings kahit Hindi nkapasa po? meron po bang makakasagot sakin? kailan po ba ang filing s bacolod? kailangan po ba ang NBI? goodmorning.kanus-a ang filing usab sa let board examination for teacher? FIRST TIMER PO AKO. ANO PO YUNG METERED DOCUMENTARY STAMPS? SAAN PO IYON KUKUNIN? SALAMAT. hello maam/sir...repeater po ako.kailangan po ba ng bagong cedula kahit ngayong december 2017 ako mgfile?